Background Diabetic patients should receive self-management education to improve self-care and quality of life but are frequently unable to attend such programs because of the time commitment. We instituted an intensive 2-hour Diabetes Boot Camp to provide this education in a condensed time frame. The objective was to determine the long-term effect of the boot camp on mean hemoglobin A1c (HgA1c) levels in patients with diabetes compared to diabetic patients receiving the standard of care. Methods The Diabetes Boot Camp population was defined as all diabetic patients referred to the boot camp from the 10 highest utilizing physicians between August 2009 and August 2010. A control population was randomly selected from these same physicians' diabetic patients during the same period. Baseline and postintervention HgA1c measurements on the same patients in both groups were extracted from the electronic medical record. Subpopulations studied included those with HgA1c ≥9% and <9% at baseline. To evaluate long-term effects, we compared HgA1c levels 3 years later (between July 1, 2012 and December 31, 2012) for all groups. Results Using comparison-over-time analysis, the overall boot camp group (n=69) showed a mean decrease in HgA1c from 8.57% (SD ± 2.32%) to 7.76% (SD ± 1.85%) vs an increase from 7.92% (SD ± 1.58%) to 8.22% (SD ± 1.82%) in the control group (n=107, P<0.001). Mean length of follow-up was 3.2 (SD ± 0.54) years. Conclusion An intensive 2-hour multidisciplinary diabetes clinic was associated with significant long-term improvements in glycemic control in diabetic participants of the clinic. Self-management education is an essential element for combating diabetes and its complications, as well as for improving patients' quality of life.2 Multidisciplinary teams led by a diabetes educator and typically including a registered nurse, registered dietician, and a pharmacist have demonstrated the best results.3 However, the availability of the requisite practitioners and time present major barriers to success. To address these obstacles, the Ochsner Internal Medicine Clinic developed a Diabetes Boot Camp as an alternative to the more comprehensive, multivisit American Diabetes Association (ADA)-certified education program offered by the Ochsner Diabetes Institute. The boot camp is a single 2-hour session during which patients spend 30 minutes each with a nurse practitioner or physician, a pharmacist, a nurse educator, and a dietician. Short-term results after a mean of 6 months, comparing patients who attended the boot camp with those who received standard care in the clinic, demonstrated a significant improvement in glycemic control.4 This study is a follow-up of the same patients to evaluate long-term efficacy of the Diabetes Boot Camp. 1. In the group of patients with HgA1c ≥9%, was there a greater decrease in HgA1c among the patients receiving care in the Diabetes Boot Camp compared with those receiving the standard of care? 2. In the group of patients with HgA1c <9%, was there a greater decrease in HgA1c among the patients receiving care in the Diabetes Boot Camp compared with those receiving the standard of care? 3. 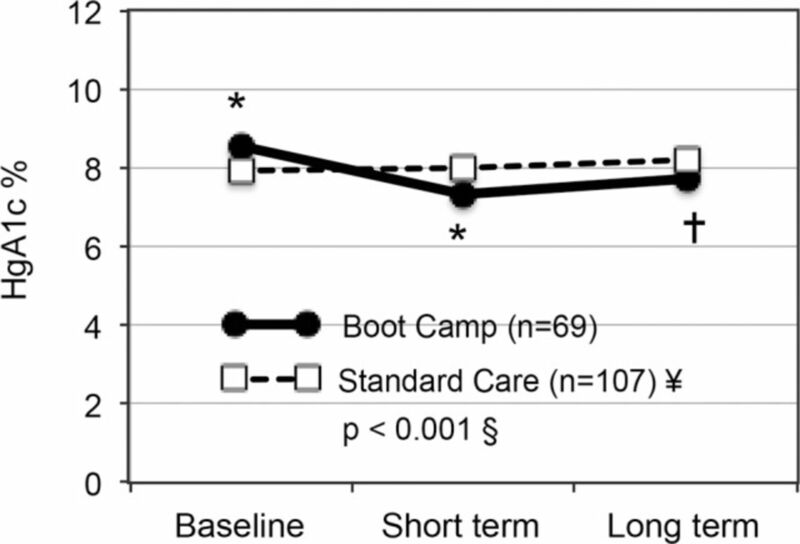 Was the decrease in the average HgA1c level greater in the patients receiving care through the Diabetes Boot Camp compared with those receiving the standard of care? The exposed group was defined as all patients referred to the Diabetes Boot Camp between August 27, 2009, and August 26, 2010, by the 10 primary care physicians with the highest referral rates to the boot camp. The control population of diabetic patients was randomly selected from these same referring physicians' patient populations during the same period. No control patients were referred to the Diabetes Boot Camp. The study populations consisted of both previously diagnosed diabetic patients and newly diagnosed diabetic patients. Patients with both type 1 and type 2 diabetes were included in the study. A variety of treatments, including lifestyle changes, oral hypoglycemics, noninsulin injectable agents, and long- and short-acting insulins, was prescribed in both the standard treatment group and in the boot camp group. Data were electronically captured from electronic records and verified by randomized chart review. Pre- and postexposure HgA1c measurements in patients who attended the Diabetes Boot Camp were collected, as well as pre- and postvisit HgA1c measurements across the same time interval among the control patient population. The preexposure HgA1c value in the Diabetes Boot Camp group was defined as the HgA1c value obtained closest to the date prior to the Diabetes Boot Camp visit but within 6 months of the visit. The short-term, postexposure HgA1c value was defined as the first HgA1c value following the Diabetes Boot Camp visit and within 3-6 months of the visit. Long-term outcomes were defined as the latest HgA1c values between July 1, 2012, and December 31, 2012. The measurement and definition of the short-term and long-term HgA1c levels in the control group were the same as in the exposed group except that corresponding routine clinic visits instead of boot camp visits anchored the timing of the HgA1c measurements. The only unique variable between the control and exposed groups was the participation of the patient in the Diabetes Boot Camp. Additionally, patient charts were manually reviewed to determine the incidence of insulin starts in both the control and exposed groups. Insulin starts were defined as any patient not on insulin therapy at the time the preintervention HgA1c value was obtained who began insulin therapy before the long-term, postintervention HgA1c value was obtained. These patients were identified, and the rate of insulin starts was compared between the study groups. The Diabetes Boot Camp consisted of 4 separate 30-minute visits with a multidisciplinary team. During those 2 hours, each patient was individually evaluated by a physician or nurse practitioner, a pharmacist, a nurse educator, and a registered dietician. Each healthcare professional had defined roles. The physician or nurse practitioner evaluated the patient, addressed patient concerns, and made treatment decisions based on the patient's medical status. This evaluation included an assessment of disease severity, preventive healthcare needs, and appropriate adjustment of therapy. The pharmacist evaluated the patient's medical regimen, drug interactions, financial constraints impacting medical adherence, and side effects. The pharmacist also made recommendations for adjustments related to comorbidities, renal or liver disease, and generic utilization goals. The nurse educator reviewed the plan of care for diabetes management: basic pathophysiology, blood sugar monitoring, treatment of hypoglycemia, treatment of hyperglycemia, self-care, when to call the physician, and follow-up care. Finally, a registered dietician addressed individual nutrition needs and assessed the patient's willingness to change, taking into account any personal and cultural preferences. A goal range for carbohydrate intake at meals was suggested and food label information reviewed during this medical nutrition therapy (MNT) visit. Educational material regarding nutrition for diabetic patients was also provided. The visit was completed when a nurse coordinator ensured all follow-up appointments had been made, appropriate vaccines given, and medication and supplies provided. Standardized documentation in the chart was reviewed during the session using a preprinted form with a checklist and areas that allowed for a short narrative. For statistical analysis, the HgA1c mean differences between the control cohort and the boot camp cohort at each period were calculated and then compared using t tests. In addition, we also tested the effect of time within each cohort. For instance, for the control cohort, we computed the difference in means at baseline and follow-up visits to assess statistical significance. P values <0.05 were considered statistically significant. All analyses were performed using Stata v.11 (College Station, TX). Of the 176 patients available for long-term follow-up, 69 were in the Diabetes Boot Camp cohort and 107 were in the control cohort. The boot camp cohort had a baseline HgA1c of 8.57%, a short-term follow-up value of 7.34%, and a long-term follow-up HgA1c of 7.76%. The control cohort experienced a steady rise in HgA1c from a baseline of 7.92% to 8.02% in the short term and 8.22% in long-term follow-up. See Table 1. The mean time to the first measurement in the short-term analysis was 6.26 months (SD ± 4.09). The mean time to the second measurement in the long-term analysis was 3.2 years (SD ± 0.54). Mixed models with random effects were employed to assess how the change in HgA1c over time differed between the boot camp group and the control group using group-by-time interaction. A significant difference was seen between the 2 groups (z=–4.28, P<0.001; Figure 1). Group-by-time interaction effects–overall results. * P<0.05 compared to standard care at baseline and short term, respectively. † P>0.05 compared to standard care at long term. § P value showing comparison between groups over time. ¥ n=99 at long term. HgA1c, hemoglobin A1c. 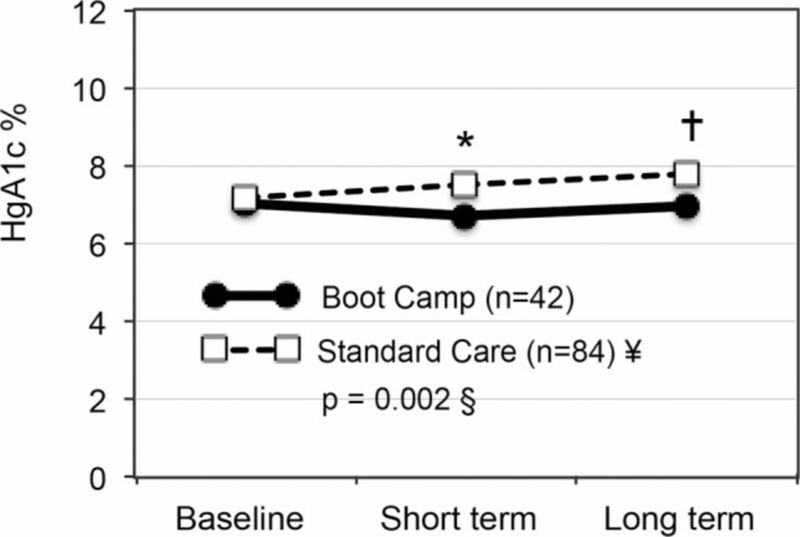 Patients in the boot camp cohort with baseline HgA1c <9% (n=42) improved from 7.02% to 6.73% in the short term, followed by an increase to 6.96% in the long term. In comparison, HgA1c values in patients in this control group (n=84) steadily rose from a baseline of 7.19% to 7.50% in the short term and to 7.79% in the long term. See Table 2. The mean time to the first measurement in the short-term analysis of patients with HgA1c <9% was 6.55 months (SD ± 4.10). The mean time to the second measurement in the long-term analysis of patients with HgA1c <9% was 3.27 years (SD ± 0.52). In this analysis of better controlled diabetic patients, mixed models with random effects were employed to assess how the change in HgA1c over time differed between the boot camp group and the control group using group-by-time interaction. Significant differences were found between the 2 groups of patients with HgAlc <9% (z=–3.10, P=0.002; Figure 2). Group-by-time interaction effects in the hemoglobin A1c (HgA1c) <9% group. † P>0.05 compared to standard care at baseline. * P<0.05 compared to standard care at short term and long term, respectively. § P value showing comparison between groups over time. ¥ n=78 at long term. Finally, in comparing patients in the study with baseline HgA1c levels ≥9%, those in the boot camp cohort (n=27) improved initially from 10.97% to 8.29% in the short term, followed by a rise to 9.0% in the long term. In comparison, HgA1c in patients in the control group (n=23) steadily decreased from a baseline of 10.59% to 9.94% in the short term (P<0.003) and to 9.82% in the long term. See Table 3. The mean time to the first measurement in the short-term analysis of patients with HgA1c ≥9% was 5.3 months (SD ± 3.96). The mean time to the second measurement in the long-term analysis of patients with HgA1c ≥9% was 3.0 years (SD ± 0.51). Mixed models with random effects were employed to assess how the change in HgA1c over time differed between the boot camp and the control group using group-by-time interaction. No significant differences were found in the HgA1c ≥9% group (z=–1.74, P=0.082; Figure 3), indicating that the overall time did not have a significant effect in changing HgA1c levels in the 2 groups. Group-by-time interaction effects in the hemoglobin A1c (HgA1c) ≥9% group. † P>0.05 compared to standard care at baseline and long term, respectively. * P<0.05 compared to standard care at short term. § P value showing comparison between groups over time. ¥ n=21 at long term. The frequency of insulin starts in the boot camp group (n=3, 4%) was not significantly different from the number of insulin starts in the control group (n=13, 12%; P=0.069). In our previous report of the short-term results of the Diabetes Boot Camp intervention, we reported significant declines in HgA1c in the participants of the boot camp compared to the control group. These short-term results were noted within 6 months of the patients' participation in this single 2-hour clinic visit.4 This current study assessed the impact after a mean follow-up of 3.2 years. The analysis indicates an enduring association of this single intervention with continued significantly lower HgA1c levels over time in the participating population compared to the control population. Furthermore, we did not see a difference in the rate of insulin starts in the 2 groups. To our knowledge, our report is unique in providing evidence of a long-term benefit of this type of single, multidisciplinary educational episode in improvements in glycemic control. Our subanalysis studied the effects of the boot camp on patients with well-controlled and poorly controlled diabetes. Interestingly, only the well-controlled group showed a significant improvement over time at the 3-year mark. In contrast, although the poorly controlled group attending the Diabetes Boot Camp showed a significant early improvement, the group experienced a gradual upward trend in HgA1c values, while the standard of care group's HgA1c values slowly trended downward. 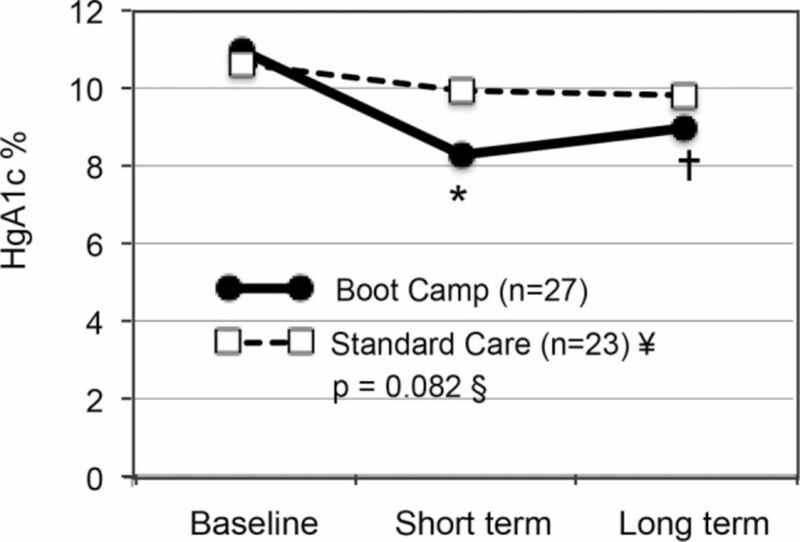 The upward trend in the HgA1c of the Diabetic Boot Camp population after the 6-month endpoint may indicate that additional educational sessions may be of benefit in reinforcing the lessons learned and improving the durability of the effect. This educational reinforcement may have been most helpful for those in the well-controlled group because the HgA1c values in that group drifted up almost to baseline levels by the 3-year follow-up. The gradual trend in those receiving the standard of care was toward worse glycemic control. Studies have demonstrated that other tools effective in improving long-term glycemic control include group medical visits and psychological counseling.18,19 Despite the many studies indicating the effectiveness of various interventions, lack of adherence to recommended therapy by patients with diabetes has been a major factor in poor diabetes control. Overall efforts to improve adherence have met with mixed results. In fact, a Cochrane review evaluated the overall effectiveness of various interventions to improve adherence to diabetes care recommendations and concluded that none of the interventions they studied appears to confer a benefit.20 The findings of this Cochrane review indicate that implementing an effective diabetes education clinic remains an elusive goal. The Diabetes Boot Camp was unique in its structured approach with 4 consecutive 30-minute visits with various healthcare specialists to advance the patient's understanding of diabetes and provide customized recommendations to improve disease management. As noted, each of the 4 visits has been independently associated in the literature with improvements in measures of diabetes care. In our study, the combination of all 4 of these interventions in 1 session appeared to have long-term benefit. The clinic also met an unfilled need for diabetes education. Primary care physicians were unable to devote 2 hours of office visit time to such education for each patient. At the same time, the longer, more rigorous, ADA-certified education programs frequently required more time than patients were able to commit to such instruction. This study had several potential limitations. Selection bias may have occurred in the comparison of patients in the boot camp group with patients in the control group because those participating in the diabetes clinic may have been better motivated. We also did not measure other parameters of diabetes care including cardiovascular risk assessments, hospitalization rates, or cost-effectiveness data. Patients and physicians have been quite satisfied with the services provided by the Diabetes Boot Camp. Physicians note the clinic has relieved them of much of the diabetes educational activity that they found hard to provide on their own to their patients. The concept has been awarded a federal Beacon Community Cooperative Agreement Program grant and has been replicated at other sites in our healthcare system. This study found an association between an intense, single 2-hour multidisciplinary clinic and long-term improvements in glycemic control in patients with diabetes. Such a clinic may provide an important tool in the array of offerings providers can present to diabetic patients to help improve their long-term outcomes. Funding for this study of the Diabetes Boot Camp was provided by the Ochsner Department of Internal Medicine and the Ochsner research administration. (2011) Data from the 2011 National Diabetes Fact Sheet, January 26, http://professional.diabetes.org/admin/UserFiles/0%20-%20Sean/FastFacts%20March%202013.pdf. Accessed August 12, 2014. (2002) Educating patients: diabetes self-care. Nurse Pract, Suppl:16-23; quiz 23-14. (1, 2010) National standards for diabetes self-management education. Diabetes Care 33(Suppl 1):89–96. (Summer 2013) Effects of a diabetes boot camp on hemoglobin a1c levels. Ochsner J 13(2):194–199, pmid:23789004. (6, 2010) Medical clinics versus usual care for patients with both diabetes and hypertension: a randomized trial. Ann Intern Med 152(11):689–696, pmid:20513826. (9 20, 2005) Meta-analysis: chronic disease self-management programs for older adults. Ann Intern Med 143(6):427–438, pmid:16172441. (2 8, 2011) Effectiveness of disease-management programs for improving diabetes care: a meta-analysis. CMAJ 183(2):E115–E127, pmid:21149524. (7, 1999) Improved control of type 2 diabetes mellitus: a practical education/behavior modification program in a primary care clinic. South Med J 92(7):667–672, pmid:10414474. (10 26, 2002) Interventions used in disease management programmes for patients with chronic illness-which ones work? Meta-analysis of published reports. BMJ 325(7370):925, pmid:12399340. (12, 2010) The evidence for medical nutrition therapy for type 1 and type 2 diabetes in adults. J Am Diet Assoc 110(12):1852–1889, pmid:21111095. Bantle JP, Wylie-Rosett J, Albright AL (1, 2008) Diabetes Care, Nutrition recommendations and interventions for diabetes: a position statement of the American Diabetes Association (American Diabetes Association), Erratum in: Diabetes Care. 2010 Aug;33(8):1911, 31, Suppl 1, pp 61–78. et al. (3, 2002) The evidence for the effectiveness of medical nutrition therapy in diabetes management. Diabetes Care 25(3):608–613, pmid:11874956. (4, 1999) Effects of the National Cholesterol Education Program's Step I and Step II dietary intervention programs on cardiovascular disease risk factors: a meta-analysis. Am J Clin Nutr 69(4):632–646, pmid:10197564. (12, 2003) Seventh report of the Joint National Committee on Prevention, Detection, Evaluation, and Treatment of High Blood Pressure. Hypertension 42(6):1206–1252, pmid:14656957. (6, 2001) Medical nutrition therapy in type 2 diabetes. Nurs Clin North Am 36(2):203–216, pmid:11382560, vi. (12, 2012) Pharmacist interventions to improve cardiovascular disease risk factors in diabetes: a systematic review and meta-analysis of randomized controlled trials. Diabetes Care 35(12):2706–2717, pmid:23173140. (2011) (2011) Assessing the value of the diabetes educator. Diabetes Educ 37(5):638–657, pmid:21878591, Sep-Oct.
(4, 2001) Chronic care clinics for diabetes in primary care: a system-wide randomized trial. Diabetes Care 24(4):695–700, pmid:11315833. (5, 2004) Systematic review and meta-analysis of randomised controlled trials of psychological interventions to improve glycaemic control in patients with type 2 diabetes. Lancet 363(9421):1589–1597, pmid:15145632. (2005) Interventions for improving adherence to treatment recommendations in people with type 2 diabetes mellitus. Cochrane Database of Syst Rev, Apr 18;(2):CD003638, Review.